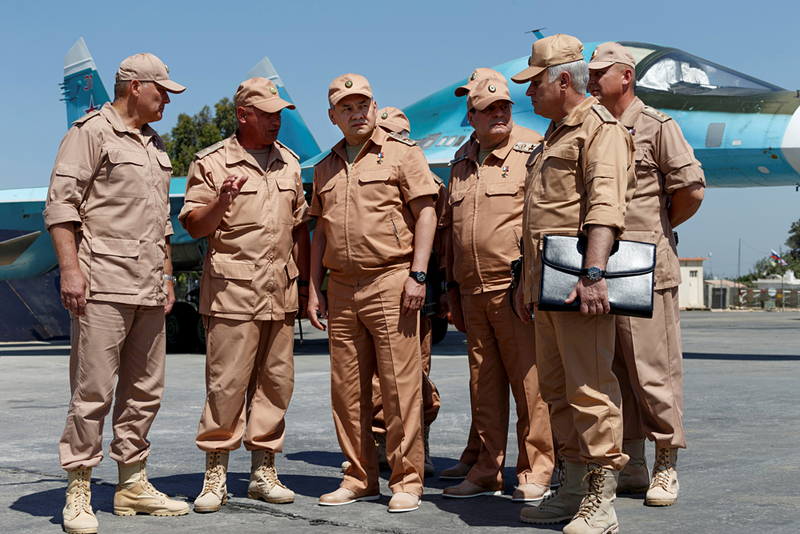 Russian Defence Minister Sergei Shoigu (3rd left) visits Hmeymim air base in Syria, June 18, 2016. Barack Obama, the American President, has made an offer to Russia to begin joint combat operations against terrorists of the Al-Nusra Front. Some Russian analysts believe the overture has been made to strengthen the Democratic Party’s position in the presidential elections. There could also be positive implications for Moscow in such a move. The White House has decided to extend combat operations against the Al-Nusra Front in Syria. US President Barack Obama said he was ready to expand joint operations with Moscow if the bombing of pro-Western units, like Jaish al-Islam and Ahrar al-Sham, ceases. Russia’s Defence Ministry has reacted positively to the American proposal and said that Minister Sergei Shoigu, in May 2016, had also spoken in favour of joint operations. Moscow is interested in expanding cooperation. Russian specialists believe this will not only help in solving the Syrian crisis, but would also lead to progress in Iraq and Afghanistan. Moscow, however, is concerned that the Pentagon does not plan to give the Russian Ministry of Defence precise coordinates of its formations, instead limiting itself to listing the zones that are "free from strikes by the Syrian and Russian air forces." "Cooperation may be complicated by a series of factors,” said Dmitry Litovkin, a military analyst from the Izvestia daily newspaper. “Firstly, there is the Pentagon's unwillingness to give Moscow the coordinates of the pro-Western formations, instead just delineating the combat zones." Such secrecy, Litovkin seems to suggest, could have a negative impact on the effectiveness of joint operations. Several American analysts share Moscow's concerns. Robert Ford, former U.S. Ambassador to Syria told The Washington Post that even if Damascus agrees to stop bombing the neighbourhoods where pro-Western groups are based, nothing would prevent the Al-Nusra Front militants from moving their troops into regions that are not slated for bombing. Where will the main fighting take place? Vladimir Evseyev, deputy director of the Institute of CIS Countries, said Washington’s principle combat objective is to liberate the city of Al-Raqqah from Islamic State terrorists. "Obama wants to liberate the civilians and make his mark on history,” says Evseyev. “At a time when the Syrian Army is leaving the Al-Raqqah Governorate and is practically stopping its advance on the provincial capital, pro-Western formations, with the help of American air power, will soon begin the offensive on the city." The main route for the Syrian Army will be towards Aleppo, the liberation of which is Syrian President Bashar al-Assad's key to success in this war. It is in that direction that Assad will move his army. "From a military-tactical point of view, Al-Raqqah is not very important,” said Evseyev. “It is much more important in this stage of the war to regain control of the northern neighbourhoods of Aleppo. This will help ‘clean up’ the terrorists' transportation corridor, through which they receive their provisions, ammunition, medicine and reinforcements."